[146 Pages Report] The telecom managed services market size is expected to grow from USD 11.90 billion in 2017 to USD 22.58 billion by 2022, at a Compound Annual Growth Rate (CAGR) of 13.7%. Managed services is a common phenomenon for CSPs to move their Capital Expenditure (CapEx) model to Operational Expenditure (OpEx) model in order to achieve operational efficiency in the business processes. It also helps CSPs to focus on their core business activities and take a new role in the value chain with new business model. In managed services, enterprises outsourced their business operation specifically services related to ICT ecosystem on Service Level Agreements (SLA). It basically includes maintenance and operation of the day-to-day business processes of enterprises network infrastructure and services. The base year considered for the study is 2016 and the forecast period has been determined from 2017 to 2022. The businesses are growing rapidly at a higher pace, due to which, enterprises are steadily relying on MSPs. An MSP helps enterprises to achieve high business outcomes by providing a high level of services. The enterprises are facing a lot of challenges in terms of revenue, cost implementation, business transformation, and increased competition in the marketplace in the telecommunications sector due to which they have decided to rely on MNOs and CSPs. The service provider maintains all the network infrastructure at a very low price. It also helps them to move costs from CapEx to OpEx with a greater flexibility. Cost reduction is one of the main drivers that enterprises are opting for adopting managed services. To define, describe, and forecast the telecom managed services market on the basis of service types, organization sizes, and regions. After arriving at the overall market size, the total market has been split into several segments and subsegments. The figure below shows the breakdown of the primaries on the basis of company, designation, and region, conducted during the research study. The figure below shows the break-down of the primaries on the basis of the company, designation, and region, conducted during the research study. The major vendors in the telecom managed services market are Accenture (Ireland), Amdocs (US), AT&T (US), CenturyLink (US), Cisco (US), Comarch (Poland), Comcast (US), Ericsson (Sweden), Fujitsu (Japan), GTT (US), Huawei (China), IBM (US), Juniper Networks (US), Motorola (US), Nokia Corporation (Finland), NTT Data (Japan), Sprint (US), Tech Mahindra (India), Unisys (US), Verizon (US), Vodafone (UK), Windstream (US), Wipro (India), Zayo (US), and ZTE Corporation (China). In 2015, Cisco and Telecom Italia entered into a partnership in which Telecom Italia provided new Cisco-enabled managed business services, including Cisco Meraki, to organizations all over Italy as a part of its advanced LAN management offering. In 2014, Ericsson entered into an agreement with Reliance Communications Limited for seven-year in order to operate and manage their wireline and wireless networks across India for 2G, CDMA, and 3G mobile networks. The report is broadly segmented into services type, organization size, and region. 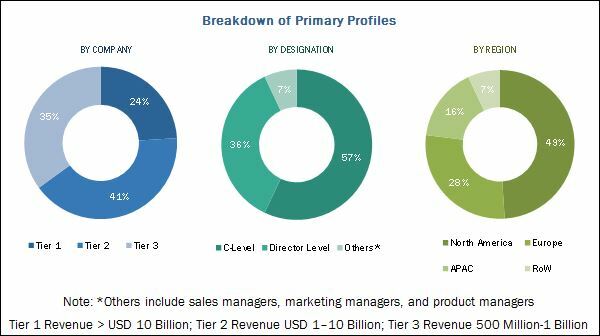 The telecom managed services market is expected to grow from USD 11.90 billion in 2017 to USD 22.58 billion by 2022, at a Compound Annual Growth Rate (CAGR) of 13.7%. The cost reduction in managing enterprise infrastructure, management of business outcomes and core activities, and minimizing the risk associated with business operation in terms of security has led to the increased demand for telecom managed services solutions. The telecom sector has changed dramatically in the recent years, in terms of advancement in technologies, penetration of data services, tech-savvy customers, and mergers and acquisitions of the key players, which enforced CSPs to realign their business models to deliver a high Quality of Service (QoS) to the customers and achieve a viable growth in business. The industry needs to strengthen its business strategies owing to increased competition from Over-The-Top (OTT) players, high cost of network infrastructure, decline in the core revenue, and business transformation. The telecom managed services market has been segmented on the basis of service types, organization sizes, and regions. The managed mobility services segment is expected to grow at the highest CAGR during the forecast period, while the managed data center segment is estimated to have the largest market size in 2016, in the market. Enterprise mobility is prevalent in the organization due to the increasing trend of BYOD and Corporate Owned Personal Device (COPD) across the globe. It is very important for the enterprises to have more focus towards the management and security of mobility devices. The key trends which are driving this market include growing consumption in productivity applications, workforce decentralization, globalization of business, prominence of cloud-based enterprise mobility management, and robust environment for smartphones and tablets across the organizations. The Small and Medium Enterprises (SMEs) segment is expected to grow at the highest CAGR in the telecom managed services market during the forecast period. With the increasing number of SMEs worldwide, the requirement of managed services is also increasing. The SMEs has the limited in-house network and IT infrastructure capabilities; therefore, they mostly prefer to be outsourced managed service from service providers. Managed services have become the central part of the business process due to its flexibility and ease of use and are expected to grow in the coming years. 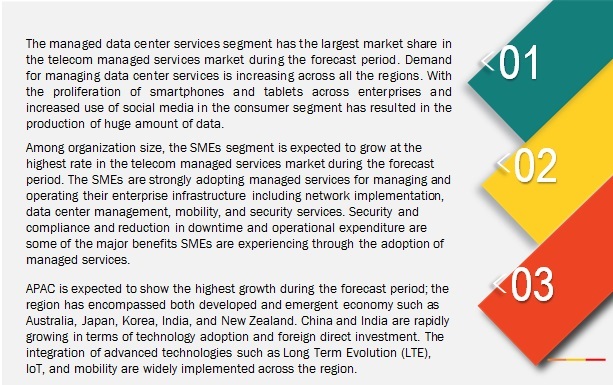 The demand for managing data center services is increasing across all regions. With the proliferation of smartphones and tablets across enterprises, and the increased use of social media in the consumer segment have produced a huge amount of data. In addition, IoT is another major area where the amount of data has been generating exponentially day by day, thus increasing the demand for high-speed processors and storage. Colocation is a data center facility, which is also known as “Colo.” It is a process of keeping the network equipment, servers, and other data center-related hardware on different locations apart from its own data center, which is known as colocation center. Businesses mostly prefer to rent spaces for servers, racks, and other devices in colocation centers, which is beneficial to them in terms of cost. A colocation center provider would offer a range of benefits to its customers, such as cooling system facility for equipment, higher bandwidth, IP allocation, and power required for the equipment. In managed hosting, the managed hosting provider has its own dedicated hardware and servers, which is utilized by the enterprise customers. The hardware and servers are installed on customer premises, managed and maintained by the managed hosting provider. Managed hosting helps the enterprise customers to proactively manage and run the IT infrastructure by emphasizing on fundamental business processes. What are the leading service areas of telecom managed service market? 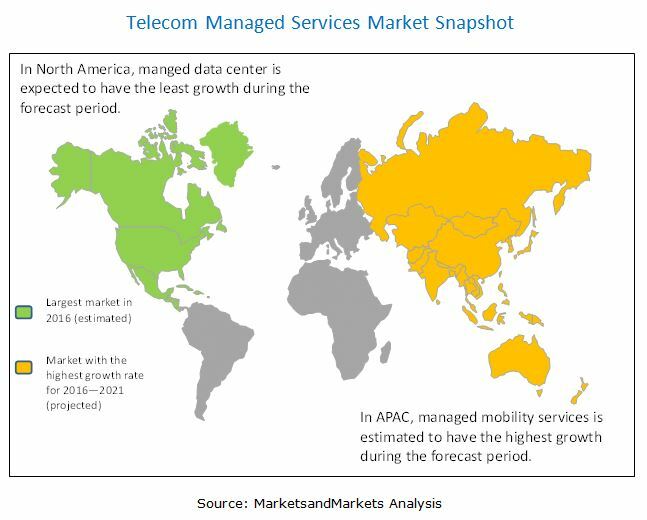 North America is estimated to have the largest market share in 2016, whereas the Asia Pacific (APAC) region is expected to grow at the highest CAGR from 2016 to 2022 in the telecom managed services market. The growth in the market size of North America is driven by technological advancement and its adoption in telecom sector is not an exception. Managed business services and network services are expected to see huge growth in this region due to the convergence of IT and telecom sector in the region. The growth in APAC is mainly driven by increasing internet and mobile services and establishments of new data centers in China, India, Singapore, and Australia. Managed service provider offers an extensive set of services such as data center services, security services, BSS/OSS services, and mobility services, which will benefit the enterprise's customer. Cost reduction in managing enterprise infrastructure, minimize risk associated with business operations in terms of security, and increased operational efficiency of business systems are the prime factors that are driving the adoption of the telecom managed services market. However, concerns over revealing the confidential information to MSPs and ensuring the optimum business functionality of the customers are acting as challenges in the adoption of telecom managed services solutions. The 15 players profiled in the market include top vanguards, innovators, dynamic, and emerging. The companies are Amdocs (Missouri, US), AT&T (Texas, US), CenturyLink (Louisiana, US), Cisco Systems, Inc. (California, US), Comarch S.A. (Kraków, Poland), Ericsson AB (Stockholm, Sweden), GTT Communications, Inc. (Virginia, US), Huawei Technologies Co., Ltd. (Shenzhen, China), IBM (New York, US), NTT Data (Tokyo, Japan), Sprint.com (Kansas, US), Tech Mahindra (Mumbai, India), Unisys (Pennsylvania, US), Verizon (New York, US), and Windstream (Arkansas, US). These players have adopted various strategies such as new product developments; mergers & acquisitions; partnerships, agreements, contracts, and collaborations; and business expansions to cater to the telecom managed services market. 10.3 Huawei Technologies Co., Ltd.